Father Don Demidoff, the priest, who left the Roman-Catholic church 30 years ago. Today he is 62 years old. What has happened during these 30 years? I lend you my wings ? Every human is born under the sign of his angel. It is the angel of his birthday. Sometimes this angel reveals himself already during childhood, sometimes not until advanced age, and sometimes not until the day of death. Of course you have to be prepared to welcome this angel and to listen to him. The angel of the mother of Jesus, Maria, was the angel Gabriel. Without any notice he stood in front of her and she was prepared to listen to him and to take his message. "Maria, you will give birth to a son and he will be the son of God." 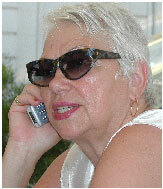 Maria was frightened, for she had not even a boyfriend, not to speak of any sexual contact. "See, I am a servant of the Lord, it will happen to me as you say it", she implicitly answered without thinking twice. And the word of the angel came true: the birth of Jesus. The angel of my birthday, the 28th of November, is the angel Enned. It was very late that he revealed himself to me. To be exact in the twelfth year of my work with the street children in Romania. He belongs to the angels of the nineth choire of of the choire of the hosts. But in truth Enned is a child. No angel is such a child as he is. He loves to catch balls and: these balls are souls. The soul as a pawn of the evil, of confusion, of aberration. He is the angel of the last rescue, the angel, who does not want anybody to get lost. Enned is overseen by all demons as they consider him to be ridiculous and unimportant, just a child. But his power comes from another dimension, the forth dimension, from heaven, where is our real home. He stands in front of the door of damnation and makes the best of a bad job. Like every child in danger runs to the rescuing hand of mother or father, this angel reaches out to the lost soul in hopelessness. For he does not want anybody to get lost. Enned, the angel child, has also caught my life-ball, my soul. Very early, and I did not know. It was a warm summer day, when I sat in my garden of the old protestant vicarage in Iacobeni, which is at my disposal. The Transilvanian Saxons, Protestants, are not here anymore. In 1991 their exodus had been completed, with bag and baggage they had emigrated to Germany, not sure, if after the supposed revolution a red vampire, another dictator, would come back. They left dignified church buildings and the vicarages behind. Besides the five hundred years old church castle I was looking for peace and remoteness. I wanted to back out from all that, to quit ? to think about how I could leave the children behind. I closed my eyes, collecting my thoughts. In front of me stood a wonderful angel, not powerful at all, with a fascinating child?s face, perfect like made of pure wax, a graceful shape, light, soft and small, the eyes like two crystal starlets, but with impressive wings, his dress full of silver-white feathers. He was decorated with dazzling sparkling glass beads, necklaces, jewels, tassels and silk scarfs in the most chatoyant colors of the rainbow. His whole child?s appearance shone in a way, that I had to squint against it, in order to look at him. He shone more white than the purest snow of a glacier. He scented so sweet like all oceans and mountains and all red poppy fields together. That was not the face of a human, not of a real child. That was not the scent of a human. Was I awake or was I dreaming? Was I in front of the door to the abyss, to damnation after all these years of humiliation, harassment, intrigues and offenses, of libel, threats and prosecution by the church in Germany and the everlasting communists in Romania on the edge of mental incapacity. My great ideal, the holy Don Bosco, had strange dreams throughout his life, which in truth were visions. He was laughed at, scolded, declared mad, especially by his superiors. Once they even wanted to shut him in a lunatic asylum. But his dreams came true, really true. His dreams were visions. Now I sat in the garden. The children absorbed me, the poor, the old, the sick without medical care, they begged endlessly, they were devouring me. Those were thoughts of failure, of desperation, of capitulation, thoughts of powerlessness. I felt my power fading away and physical pains overwhelmed me. I thought that now it was me who needed help. Some days ago a journalist had asked me: "Father, after 13 years in Romania, don?t you want to go back to Germany?" Spontaneously I had answered: "If I want to? Oh yes, I would like to, but I cannot!" And now my angel Enned stood in front of me, with a ball in his hand. "Look", he said, "what answer you gave. You cannot, because you very well know, how you are loved by your children and how you are needed here." "I have guarded you in all your ways", Enned said with a voice truly coming from another dimension. "Priest, I have guarded you in all your ways. Do not doubt. Look at me, before God you are a child as well and so bright like I appear to you. I am your angel Enned and the one of your children and the one of all your true friends and helpers, who plentifully care for you and send you their sacrifices and prayers." And he pitched the ball, which he had hold in his hand, to me and laughed: "Take back the ball of your soul. It is not the time yet, stay in front of the door of the abyss and go on saving children who seem to be lost. They need you. And if you cannot remember how you have managed all that, you shall know: I, your angel, lended you my wings. So you overcame the obstacles, the hard times, the rocks in the way, the torrents without bridges and the steep heights without ropes, and so you and all your children have been guarded by my wings. And I promise you, that I will lend you my wings in future on any occasion, when you are befallen by misfortune and evil. I promise that to you, I, your angel Enned." I opened my eyes, the angel was gone. I ran to my children and told them: "Children, we have wings! Everything we have achieved, we have achieved, because we had wings. Let us have a party, the party of wings." And my children clapped their hands with pleasure. I had already told them many stories, but this one went directly into their hearts. Ever since they keep painting angels and wings. And whenever there is a time when nothing works, when the memory of the horrible events in the streets catch up with them, when the tears roll down their cheeks, then I tell them: Here are the wings of my angel. I lend them to you until tomorrow, then I need them back for myself. Sometimes they ask me then: Are you allowed to do that? Yes, I am, he has told me. You as well shall be guarded from everything, that burdens and frightens you. With the wings of my angel you may hover over all that. And some day your own angel will reveal himself to you, then you will not need the wings of mine anymore. Enned is the angel with the ball. Since I have met him in my garden I always say hello to him, whenever I watch children playing with a ball. 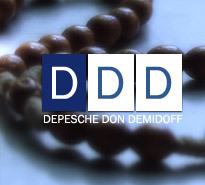 In his book "Dornenpriester" (Priest of Thorns) Padre Don Demidoff has published his curriculum vitae in the year 2005. There you can learn that in 1984 he had to change his name due to a witness-protection program submitted by German authorities, in order to avert danger of his own life. He changed his name from that of his adoptive parents to the one of his biological Russian mother. 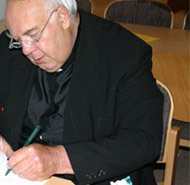 After Padre Don Demidoff had left a Catholic monastery and the Roman-Catholic church in the late sixties, he became amongst other activities the founder and editor of a magazine for emancipation and equalization of homosexuals. In the end of 1969 this meant to be a courageous step. Already then he was far ahead of the times, as these people are mostly freed from hostility nowadays, what could not be taken for granted then. During his lifetime he has always been a pioneer in serving disadvantaged groups.It is also due to him that today homosexuals like Olaf von Beust, Guido Westerwelle, Klaus Wowereit oder Karl Lagerfeld, Sir Elton John und Leonardo da Vinci are regarded in the light of their merits. During his 16 years? stay in Romania Padre Don Demidoff has given home, work and the staff of life to hundreds of street children and also adults (gypsies, prisoners), he has shown them the way to the real ecumenical Christianity and he is supported by donations and affirmation of tens of thousands of people all over the world. Unfortunately, there are still extremely thinking, intolerant and ignorant voices. 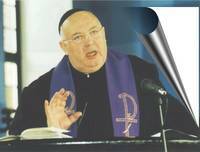 There is hostility from people, single church representatives or institutions, who disavow that all his life Padre Don Demidoff has been on the side of the weak and is still there. These people are not prepared to any dialogue, they spread untruth and stir up intrigues. This means to discredit a man because of his engagement for minorities. Padre Don Demidoff has restored a historically important saxon church, for which he used part of the money (mostly compensation for immaterial damage) he got from 84 lawsuits he won. His relief organization temporarily operated up to 3 children?s homes with 130 children at the same time. This was made possible by the donations of the people following him. In Romania he founded the "Independant Catholic Church", which itself is member of the "International Council of Community Churches USA". He got the honorary citizenship of Cincu (place of the children?s home) and was decorated with a certificate of the town of Sibiu as a personality of outstanding merits earned after the revolution. Pope John Paul II. sent him a deed with the apostolic blessing, in Israel a tree was planted for him. Why are you fighting for a street priest? Father Don calls me his only friend in Romania. That flatters me. For more than 10 years I have been his company as a lawyer. We drove cross-country, because we fought for the rights of the children and the foundation before the courts in many towns. We spent a lot of time together during the preparation of lawsuits, when sitting together in the car, our big and small victories gave us familiarness. My husband blames me for spending more time with the Father than with him. I hold Father Don's work in high esteem. It is hard work which he does not for himself but for the children and for our country. Even big trouble could not bring him to abandon the children. Many foreign foundations left my country after a while, but father Don stayed. Isn't he a rather difficult client, because he takes the authories on? The Father has an extraordinary sense of justice. Therefore he does not hesitate to bring an action against the authorities, if his children, the foundation or he himself is treated wrongly. This also shows the other people in the country that for an upright personality it is possible to get one's rights against resistance from above. For, up to now only few people have dared to conduct this kind of lawsuits. The Father admonishs the authorities to accept law. Father Don had to conduct his first lawsuit, because he did not want to pay bribe-money. It was claimed that he had built without authorization. Based on that it was decided to knock down the children's house. The children were to leave the foundation. Of course Father Don could prove that he had made a building application which had ended up in the paper basket of the authorities. In most of the cases Father Don personnally appears before court. He takes these issues very seriously and demands the courts to handle his concerns with great attention. Although in Romania it is absolutely unusual he now and then takes a hand in a hearing. Where otherwise only the lawyers speak Father Don sometimes demands to speak. Recently he appealed to the judge to also incorporate moral and ethic considerations into the judgment besides the legal ones. She admitted him to the floor for a few words only but then listened very attentively to what Pater Don had to say. Even in the court room it was quiet, where it is quite lively otherwise . I also know that he prays during the hearings and sometime he is still lost in thoughts although the next item of the agenda is already oncoming. Does Father Don fight a losing battle? No, it was not and it is not a losing battle Father Don fights. He has achieved a lot. Just look around and you can see it. These are the results of his struggle. You do not have to prove anything, you can see it. The foundation in Cincu is something bright. In an almost dead village new life has developed. You must not forget that Father Don does not only care for his children but also has created jobs. And the children spread happiness. In many other Romanian villages you only find depressed people. When will the work of Father Don be accepted everywhere in Romania? His dedication - including all sacrifices - actually is accepted by the Romanian authorities. They know how the foundation is organized and how it works. The few people who are hostile to Father Don and who are eager to stop the work of the foundation are not a representative majority. You are better off to pay them no attention. The more the prosperity in Romania improves the less will be the offenses against Father Don. Is Father Don able to achieve justice before Romanian courts? I am satisfied. We had to conduct more than 80 lawsuits, in most of the cases through all levels of jurisdiction, and except for two we have won all of them. But we have to consider some points. If e. g. Father Don claims against an authority he better does not conduct the lawsuit in the place where this authority has influence over the court. Only after relocation of the hearing you may hope for justice. Only two of 60 applications for relocation to the Supreme Court are accepted. In most of the cases we are successful. During the last 10 years we could achieve 24 relocations of hearings. That actually proves that some courts are not impartial. Thus Father Don is taken seriously. Concerning the cases of the foundation I mostly went to the Supreme Court. 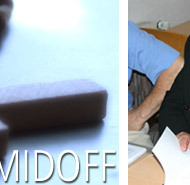 A bigger issue is the bureaucracy in Romania, but that is not only Father Don's problem. He had to conduct so many lawsuits but fight so many other battles, too. The authorities had to learn to respect law and Father Don. Very often the authorities have tried to put an end to the work of the foundation. Lawsuits were conducted on the base of false accusations. Thereby they put up with the consequence that the children would have been on the street again. Why does Father Don have so many enemies? In the beginning that was really a problem. And it is understandable: who dares to go to court against important authorities incurs their wrath. But the Father grew up much more unrestricted than we did here in Romania. The belief in authorities resulting from the communism is deep-rooted here. But Father Don does not ask if he is allowed to claim against an authority. When treated wrongly he answers back against whomever. When an application is refused a Romanian accepts it. He would never think about a second try, the refusal is definite. Father Don, however, is going to run at full speed then. He fights as long as he gets his right. Unfortunately, he is not as diplomatic as I would like him to be. Once when we were together he asked an important person when he meant to quit. I still remember the first four years when Father Don was attacked by the whole press of Romania. He was pulled to pieces in a downright concerted action. That was too conspicuous, there were people with influence who had controlled that. Father Don answered back against the detractions and he was successful. Some journalists had to pay compensation for pain and suffering and they had to print counterstatements. They have been quiet since then. But still today there is one journalist who very persistently tries to disclose the "secret" of Father Don. He is rock-solidly convinced that the work of the Father is a false front only which covers horrible things. He too was sentenced to the payment of compensation which he obviously cannot bear. The number of his enemies has decreased. Father Don has won many intercessors as well in his village as in the district town and in authorities and administration. Sometime everybody has to accept what he sees. Conditions were desperate in the past. But now look at the children's home: Everything is arranged, well-organized, you can feel the peace and see the happiness of the children! Whenever Father Don appears the children run to him. A big family. For me it is a miracle. Can Romania learn from Father Don? Well, I have been accompanying Father Don for about 10 years now and have gone through many processes together with him. You can take it from me that I know him very well. I myself have learned many things from Father Don. E. g. that also in Romania it is possible to modify laws, if they are unjust. The work of the foundation and my support resulted in the modification of two laws. As Father Don fights for his children he has set precedences so that other foundations may benefit from that. The tax investigation claimed that his foundation realized profits by donations, which he did not pay taxes on. All over the world donations are non-accessible and the Father's foundation does definitely not work for-profit. Nevertheless extensive house searches were conducted by the tax investigation. The foundation was downright attacked, documents and disks were confiscated. Based on the accusation of tax fraud a lawsuit against the foundation was filed. But the finance court rejected the arguments of the tax investigation and dropped the charges. The court judged that the foundation does not make a profit. Now the treasury department intervened and filed an appeal in order to claim against Father Don for the second time. The supreme court dismissed the appeal and once again confirmed the absolutely humanitarian character of the foundation. Moreover, the practices of the tax investigation were critized as illegal and misuse of power. This precedence helps the foundations in Romania, as they had all been mobbed by the tax investigation, and it contributed to the modification of a law in favor of foundations. But the sphere of influence of authorities is wide. The old insider relationships still exist. Surprisedly Father Don's visa, issued by the health department, could not be prolonged - at a time when he just had been appointed honorary citizen of Cincu! Also in this case we first had to go to court in order get our right and Father Don his visa. How has Father Don altered during the past years? He annihilates himself. He always is uneasy and for sure he suffers from stress, as everybody asks him to solve problems, children, staff, people from the village and people from all over the country. And there always is some problem. And he always is en-route. He is a real street priest, in Romania and in foreign countries, where he begs for his children. He has no time for relaxing. If there is a problem anywhere he is on the spot, regardless whether he is fine or not. 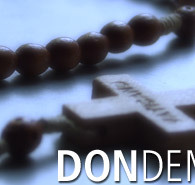 Father Don has made many sacrifices, his health has suffered damages. Of course this has had a great impact on him. But he is fighting for his children as he did the very first day. It is a shame that Father Don had to settle so many quarrels in court. He was the winner, otherwise the foundation would not exist anymore. But it has also taken much of his energy. Why do the Romanians mistreat their children? They lack affection, the love of humans for their children? It is a social problem. Justice only can partially provide for the protection of children. Actually mothers should have to show their identity card before delivery and the hospitals are obliged to pay attention to the adherence to this regulation. What is normal in other countries, does not work in Romania yet. What does he give them for their lives? Much. First of all education, then belief. They learn how to live love. He raises the wish to continue this orderly life after having left the foundation and to educate their children in the same way. Maybe later on they will think about how paying out interest. Father Don gives an example, he is not only talking about it but he is living it. Insofar his legacy for the children could be: A straight human with a strong belief will always be the winner.